After using the washer magic on the washing machine I was quite looking forward to using the dishwasher magic product on the dishwasher. I often notice the odour in there, especially if it hasn't been used for a day. Dishwasher magic is the ultimate in ease of use. First take off the lid, this was great as it has a special rubber plug which you leave alone so there is absolutely no mess, nothing to rinse off your hands after using it. Then put the bottle upsidedown in the cutlery basket, nothing comes out as the rubber plug is still in place. Now just start the dishwasher on a 50°C wash and leave it to it. They suggest running the hot water tap nearest the dishwasher just before turning it on, but I didn't need to do this. As the dishwasher runs it's normal cycle the hot water melts the rubber plug and allows the liquid in the bottle to come out. nasty deposits. Overall I would have to say I was pleased with it's performance and I am happy that if I continue to use it the dishwasher will laster longer and clean my washing up better. Dishwasher Magic breaks up and cleans away food oils, minerals and soap build up which can clog up the filters, pumps and jets. 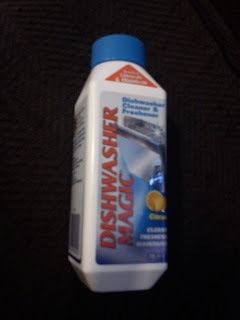 This will improve the water pressure and improve the dishwashing performance of any dishwasher. It also helps dissolve limescale. Addionally it disinfectans against salmonella, e-coli and gram-negative bacteria.